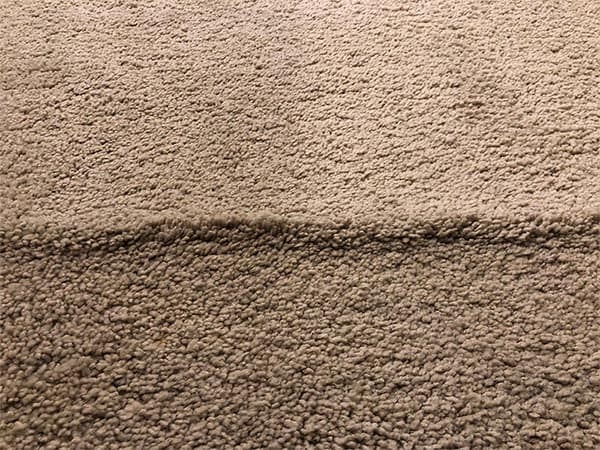 What Caused my Carpet to Buckle? Carpet buckling is a common problem that you’ve probably seen before. There are a number of factors that contribute to carpet developing buckling or ripples. This article will explore some of the common causes for carpet wrinkling of all sorts. We’ll also look at what you can do about it. Here in Denver, improperly installed wall to wall carpet seems to be far too common. Improper carpet installation can often leave the carpet loose and improperly stretched. The result is carpet rippling and buckling. We see this a lot in new home builds. Subcontractors are rushing to finish jobs and they speed through a carpet installation using the improper tools. Often, this means they skip using a power stretcher. This is necessary to properly tension the carpet, but takes more time. Proper carpet installation requires using a power stretcher to pull the carpet tight. Only then should a knee-kicker be used to place the carpet onto tack strips to hold the carpet securely against the wall. Initially the installation may look fine, but over time with other stressed placed on the carpet, carpet buckling or rippling starts to occur. Unfortunately there are plenty of inexperienced carpet cleaning companies, or those using beat up old equipment. These companies may apply too much water to a carpet. Or they may not properly extract the water. Carpet buckling occurs soon after the cleaning. Similarly, when someone rents a DIY carpet cleaner and drowns their carpet, carpet ripples can occur. Any time over-wetting of the carpet takes place, expect to see carpet ripples or buckles. The good news? Normally this is a temporary condition that can be fixed with proper drying. Certain carpets are also more susceptible to buckling or wrinkling. Usually old carpets that have stretched out over time or carpets that have been improperly installed are more likely to buckle when the are hit with steam cleaning (AKA hot water extraction). Typically if your carpet buckles after carpet cleaning, its best to wait 24-48 hours and 99 times out of 100 it will go back to it’s normal appearance. Here’s the caveat: if the carpet was left drenched and is still not dry the next day, call your carpet cleaning company (or a different one). You’ll want to discuss why it is still wet as well as options to get it dried out quickly. It’s not incredibly common with modern carpet mills manufacturing carpet, but warranties exist for a reason. If your new(ish) carpet is buckling, there is a chance that there is a manufacturing defect. Typical carpet has a primary and secondary backing. When delamination occurs, the backings can separate. This is due to the latex adhesive that holds everything together breaking down. The result? You guessed it… carpet rippling or buckling. Overwetting the carpet (think a flooded basement) or manufacturing defects can cause delamination. Normally, if you suspect that there is a manufacturing defect, you’ll need to contact the retailer and/or an independent certified carpet inspector to check things out. Another consideration is delamination due to solutions applied to the carpet that have caused damage. Acetone, for example, is frequently applied to carpet, though it really shouldn’t be. Unless it’s quickly rinsed out of carpet, acetone and other harsh chemicals can cause the carpet to delaminate. This often leads to buckling, wrinkling, or ripples in the carpet. Whenever possible, it’s best to lift and move heavy furniture, not drag it. Dragging heavy items over carpet can easily cause the carpet to buckle. It can also pull the carpet off of the tack strips that attach it to the wall. Another consideration is that when you drag anything over a carpet, it can snag and pull a carpet run. We’ve even been called to offices where people drag filing cabinets and desks over commercial carpet. 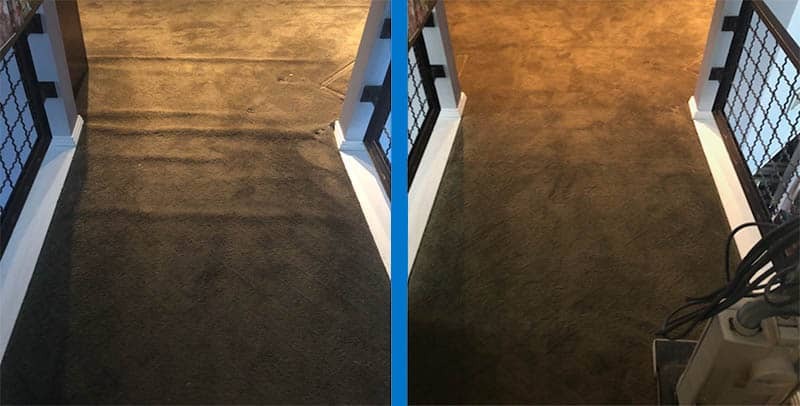 This resulted in permanent “burned in” lines drawn all over the office, leaving the occupants with no choice but to replace the entire carpet. To avoid these issue, get plenty of help with moving heavy furniture. While we don’t see this much in Denver, due to our arid climate, in more humid environments, seasonal changes can bring with it rippling carpets. As we discussed in bullet point number 2, too much moisture in carpet can cause it to buckle and wrinkle. High humidity can inject too much water into the carpet, causing it to relax. As the humidity lessens, the carpet will likely return to its normal shape again. If it doesn’t, a dehumidifier can be a good choice to fix the problem. In the world of carpet cleaning, when carpet is too wet, fans and dehumidifiers are used to reduce the humidity. In the case of moisture related carpet buckling, this can be an effective fix. Carpets have a useful life. Once that useful life is exceeded, all bets are off. Sometimes a carpet with a 10 year useful life that is properly maintained and professionally cleaned at proper intervals can last 20 years. Other times, it’s ready to be ripped and replaced at 10. The older a carpet is, the more likely it is that it’s going to buckle. Over longer periods of time, the latex and backing in carpets can begin to relax, allowing the carpet to ripple. Depending on the age and condition of the carpet, sometimes it makes more sense to replace the carpet instead of trying to salvage it. A professional opinion will help make the decision for you. What to do When Your Carpet Buckles? Typically when you have bumps, wrinkles and ripples in your carpet, its time to call the professionals to stretch the carpet. Stretching the carpet properly, using a power stretcher along with the right know-how, should eliminate your issues. A professional is going to use the right tools to properly tension the carpet, cut off the excess, reattach the carpet to the tack strips, and tuck away the excess material. Done right, your carpet buckling and ripples will be gone.